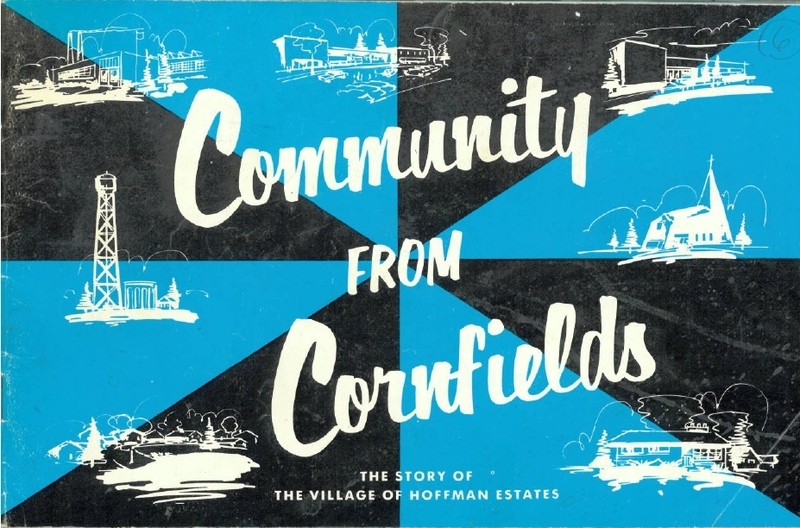 To celebrate the 10th anniversary of Hoffman Estates in 1969, the village put out this neat little booklet called Community From Cornfields: The Story of the Village of Hoffman Estates. It is 24 pages and includes everything from a brief history of the village to blurbs on the various village departments to lists of government officials and board members to a list of Hoffman Estates churches. 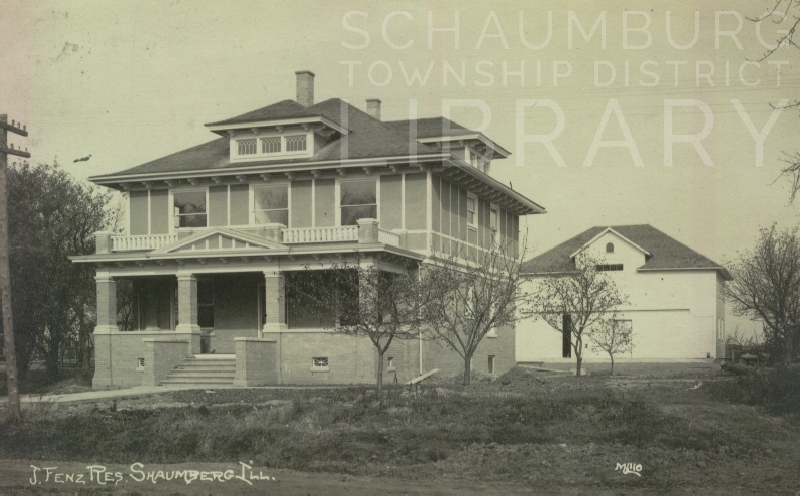 The library is fortunate to have two copies of the original document that was sent to the Thomas Guiney household on Northview Lane and the Carl Soderholm household on Bonita Drive. The most interesting part of the little booklet, though, are the surprising number of photos that are here for you to check out. This is a photo of the Gieseke family farm that was originally located off of Bode Road and is currently the site of the Children’s Advocacy Center, St. Hubert Catholic Church and School, Alliance Fellowship Church and Hoffman Estates Fire Department Station 21. 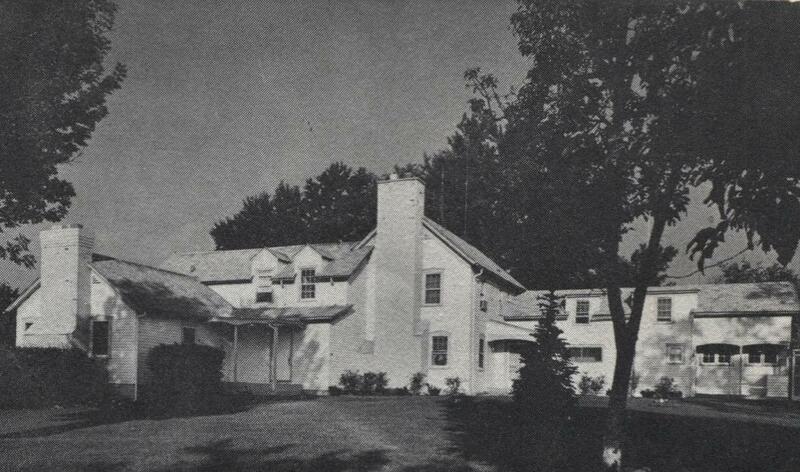 The Giesekes sold the farm in 1943 to Arthur and Dorothy Dalton Hammerstein. They lived there until 1954 when Arthur passed away and Dorothy subsequently sold the farm to Jack Hoffman of F & S Construction. This photo probably looks familiar to you. It is the Gieseke/Hammerstein house that became the Hoffman Estates village hall and is today’s Children’s Advocacy Center. When Dorothy Hammerstein sold the property to F&S, they used the house as their field headquarters. 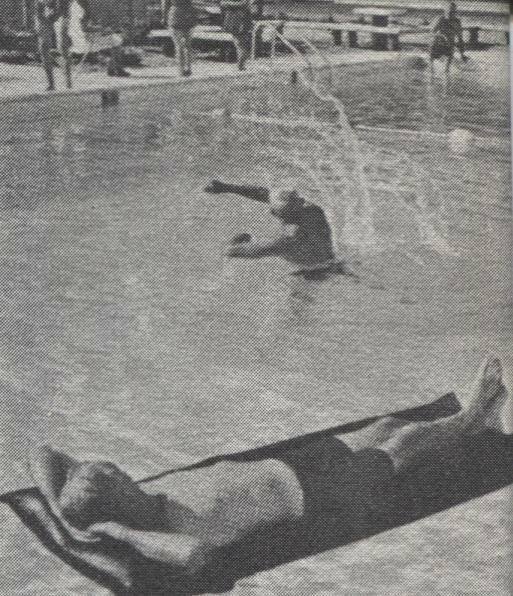 F&S then relinquished the property to the Village in 1959 and they adapted the house as their municipal center. At the time of the printing of this booklet, the village was trying to decide what to do with the property as they felt they had outgrown the building and needed a more modern structure. “The Trustees are reluctant to tear down more than a hundred years of history, however, our growing community requires a decision soon.” To their great credit they preserved the house and it exists as one of the oldest structures in the village today. It was, initially, a bit puzzling to discern what we are looking at in this aerial photo–except that the big grove of trees had to be either Sarah’s Grove or Walnut Grove. It took a bit but the thing I kept going back to is the diagonal road that crosses through the upper middle of the photo. It had to be Illinois Avenue. When I looked more closely I could see Schaumburg Road in the middle of the photo on the far right. 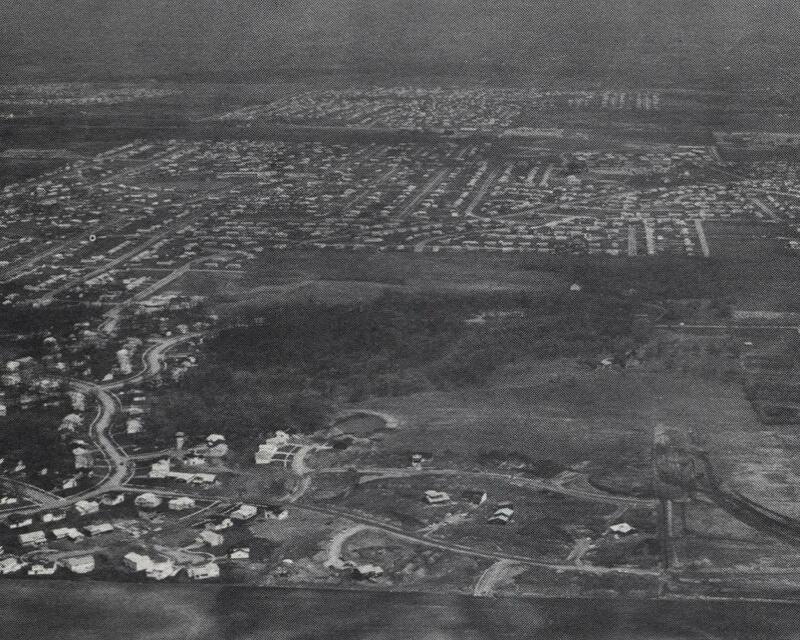 It bisects Sarah’s Grove which puts the Timbercrest subdivision in the very foreground of the photo. Friendship Village is yet to be built, since it opened in 1974. Thus, we are looking at Parcel C and the Highlands in the background. We then move into the photos that cover some aspects of Hoffman Estates government that were in place in 1969. This was Village Clerk Grace Kindelin’s office. Fire Station #1 opened in 1960 and, sixty years later, exists as Station #21. This was Fire Station #2 that was located at 469 Hassell Road. 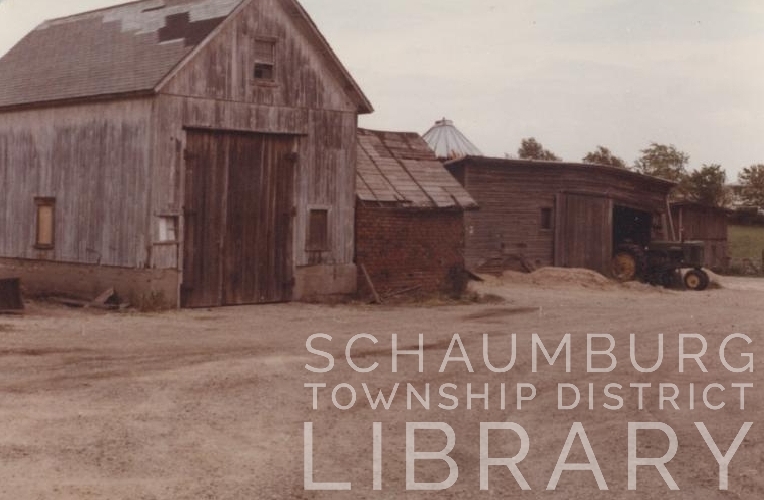 This station existed until 1974 when the village sold the building to the Schaumburg Township Public Library. The library used the building as their Hoffman Estates Branch Library until 1992. 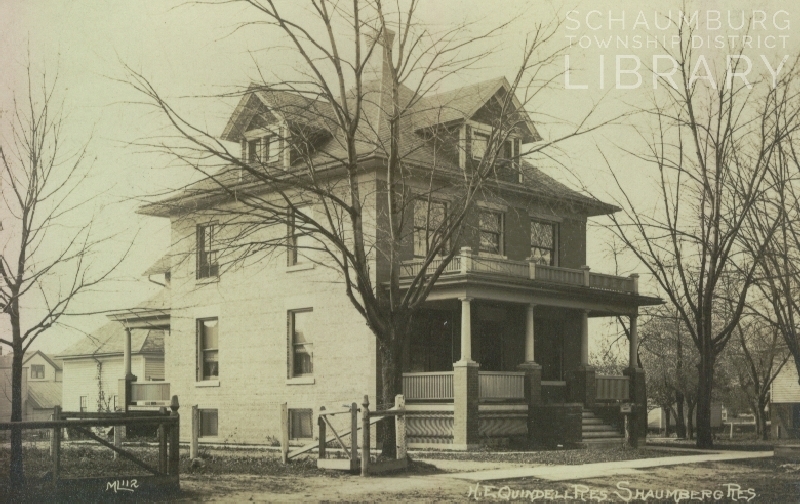 It was later torn down and the current Branch Library was erected on the spot. 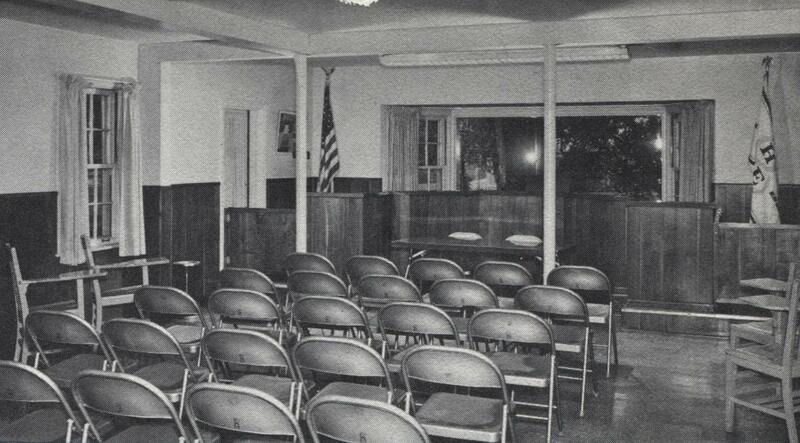 The Village Board’s chamber was the location for all board meetings. The three photos above represent the Hoffman Estates Park District which was formed in 1964–five years after the formation of the village. 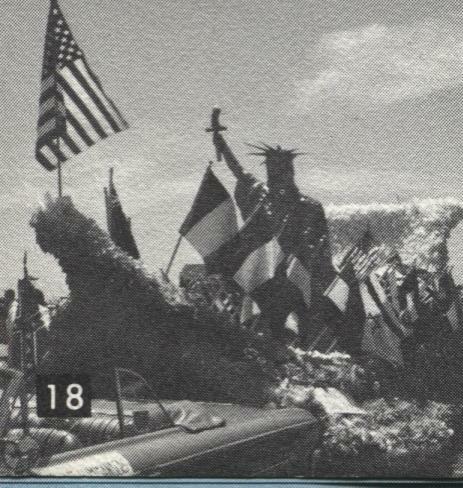 None of the photos are identified in the booklet. 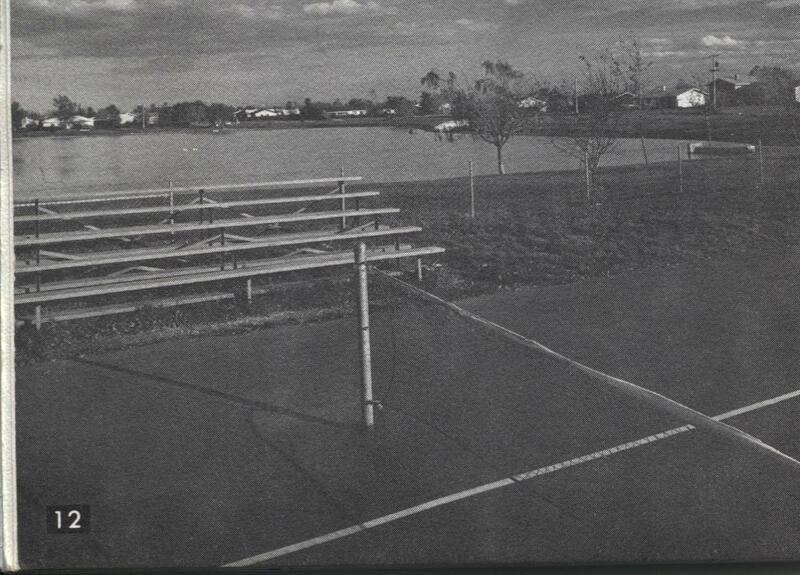 The top two are clearly built around a pond or a lake–and are possibly the same park. 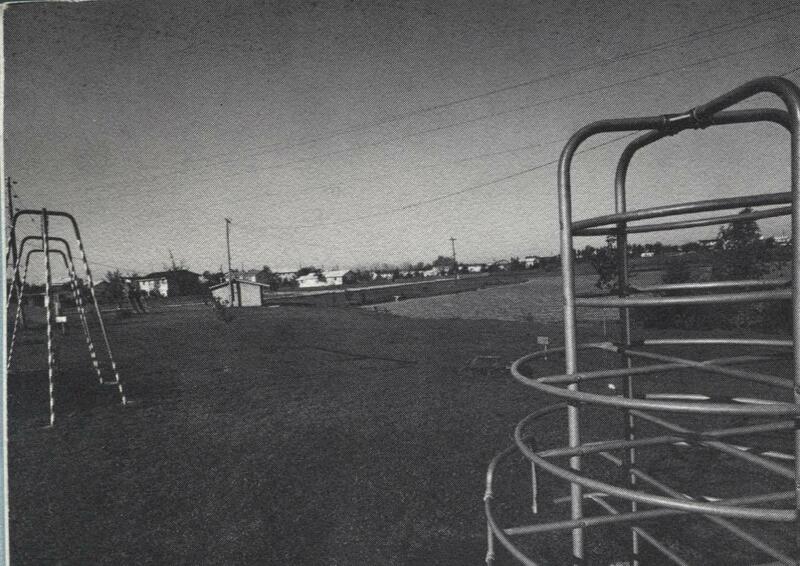 (The consensus in the comments below indicate that this was Evergreen Park near Lakeview School.) The last photo is likely the Community Pool. 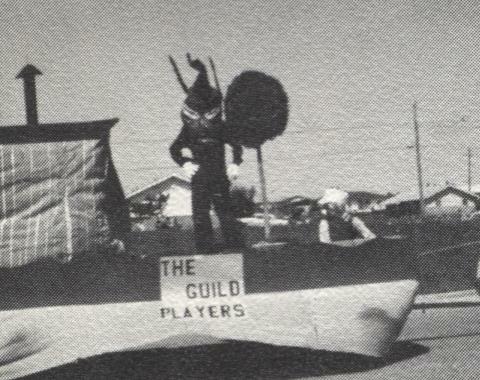 Other photos, such as the ones below, represent the various parades that took place in the young village. If you recognize any of the parades or locations of the parks, please leave something in the Comments or send me an email. It would be great to put a name to the location. Next week, schools and businesses will be featured. The businesses, in particular, were a wonderful surprise! 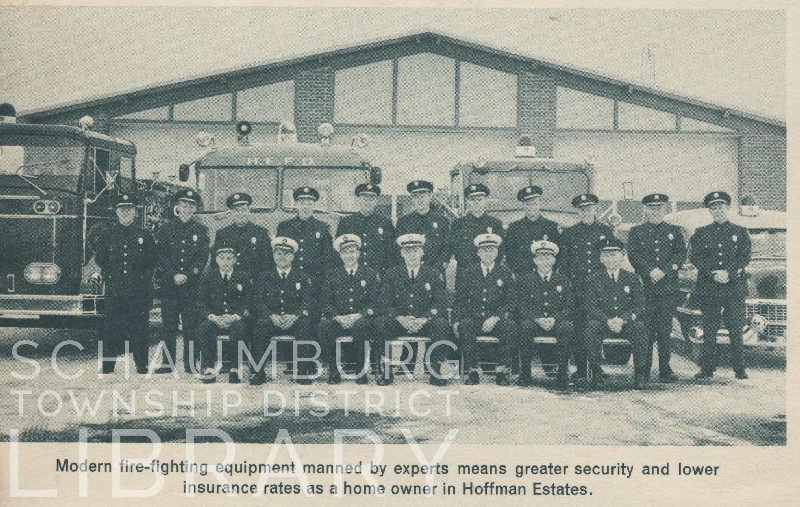 Before the village of Hoffman Estates was even incorporated, it became obvious that the burgeoning area needed its own fire protection and ambulance service. Up to this point, the Roselle Fire Protection District out of the village of Roselle had served the homeowners of Schaumburg Township. 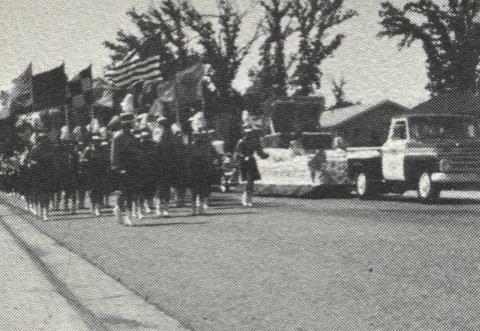 Given the distance between Roselle and the future Hoffman Estates, residents of the area voted on April 1, 1958 to form the Hoffman Estates Fire Protection District. The District was its own governing body with three trustees, a Chief and a Deputy Chief. They operated out of a barn on the Hammerstein/Village property on Illinois Boulevard. 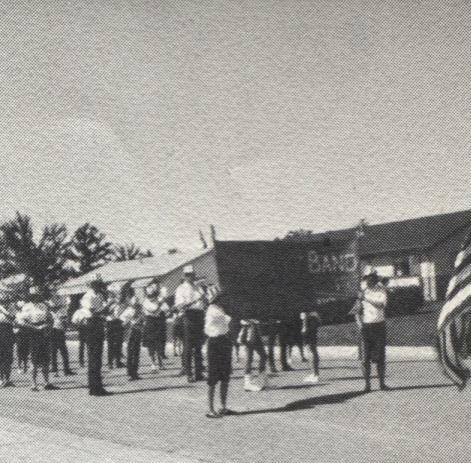 In 1959–the same year that the village was incorporated–a bond issue was approved that financed a brand new station on Flagstaff Lane. It opened the following year in November 1960 and is pictured in the photo above. It was capable of housing six vehicles and had a squad room, radio room, office and maintenance shop. It was known as Fire Station #1 and its address was 160 Flagstaff Lane. The first chief was Carl Selke and he oversaw a 30-man volunteer departmen. The fire station is still in use today, although it is now known as Station 21 and the address has changed to 225 Flagstaff Lane. 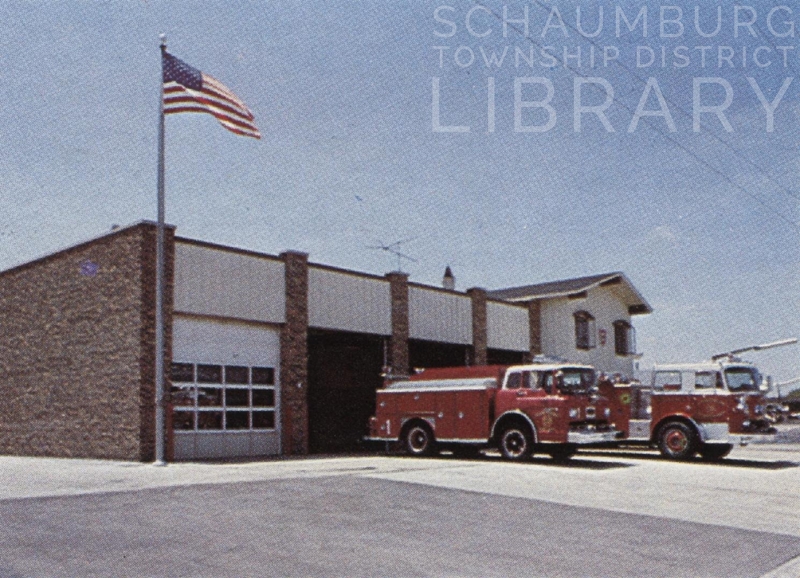 The village of Schaumburg continued to use the Roselle Fire Protection District for more than ten years after the village was incorporated. On February 20, 1966 the village board voted to disannex from the Roselle Fire Protection District and form the Schaumburg Fire Department. Later that year, Fire Station No. 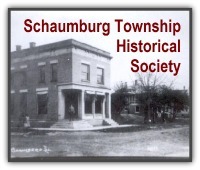 1, pictured above, was built at 1459 Schaumburg Road. Campanelli Brothers Construction donated the land and the building. 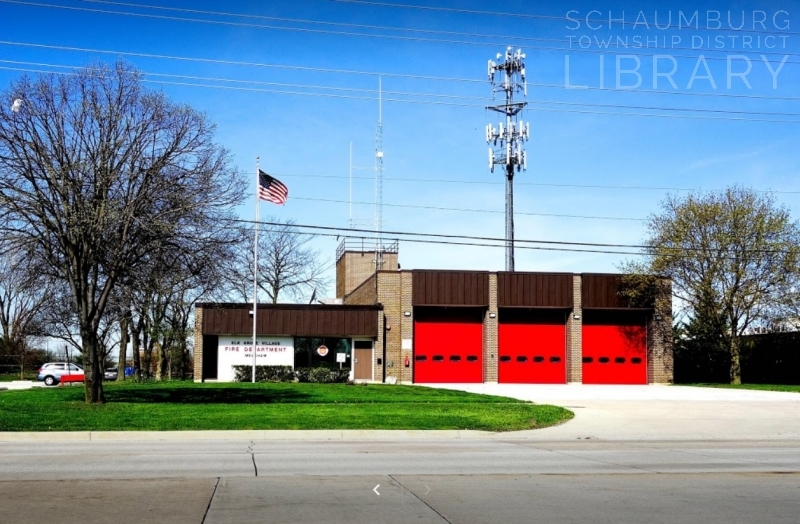 The official date of separation occurred on July 9, 1967 with the Roselle FPD selling the fire station and the equipment inside to the Village of Schaumburg for the amount of &1. A month later, Joe Zurick was chosen as the first volunteer Fire Chief of the department. Some of the other men who served were Assistant Chief Alex Riofrido, Captain Frank Musil, and Lieutenant Keith Paul and a volunteer force of 20 men that included Del Raab and Rolland Fitch. This fire station served the village well until 2006 when Fire Station One was relocated to a new building at 950 W. Schaumburg Road. The old building sat vacant until late 2007 when it was demolished. The site was eventually sold and is currently being redeveloped as a two-business strip mall. 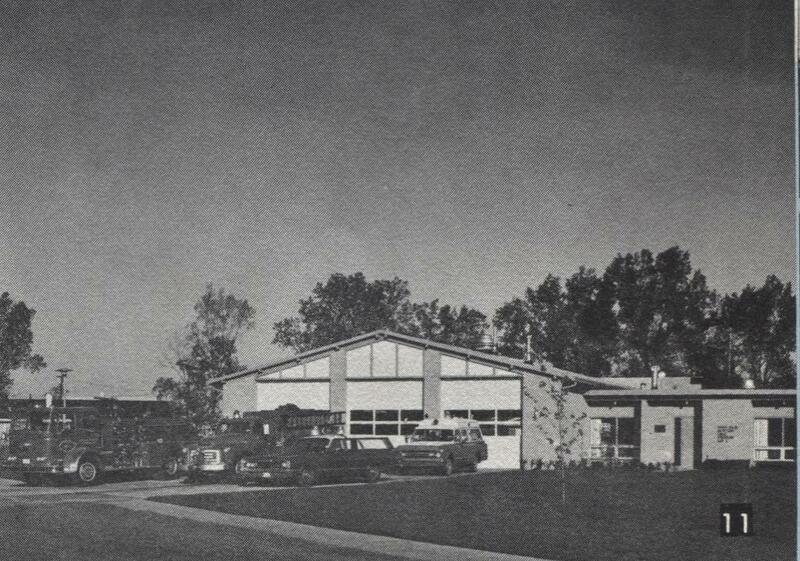 In 1977, Elk Grove Village opened a new fire station at 676 Meacham Road. 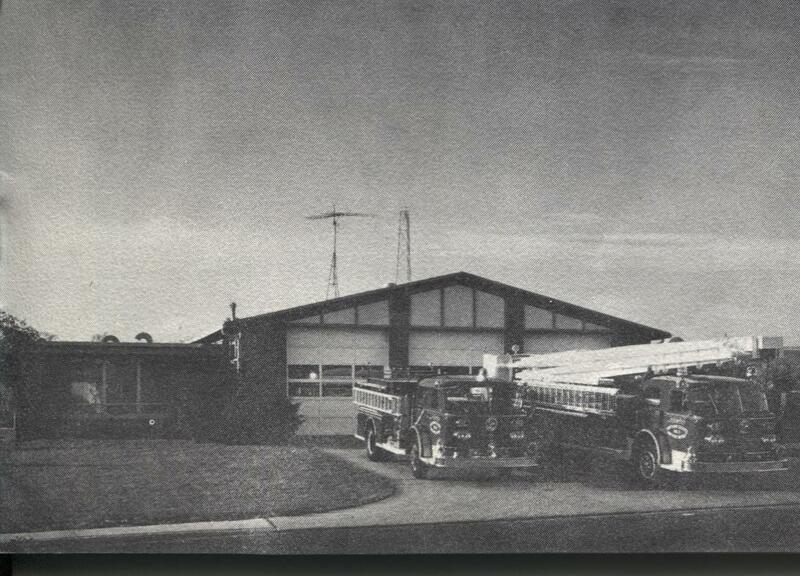 The station was known as Fire Station #10 and was the third fire station built for Elk Grove Village. 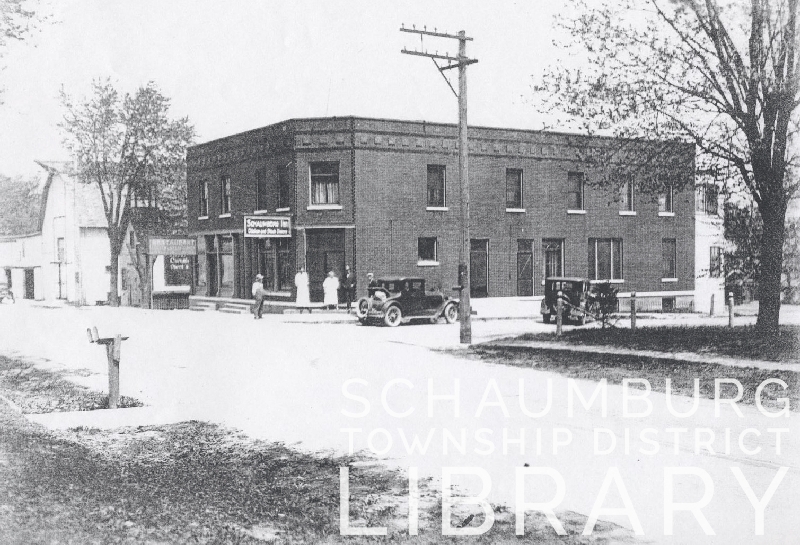 This one was built, however, to serve the residents in Schaumburg Township on the west side of Route 53. It was in use for nearly 40 years and was officially closed on February 15, 2018. The building was razed and a new one is currently being constructed on the same site. Completion is scheduled for some time in 2019. Township residents are fortunate to be so well served by these fire stations within our boundaries. Both Hoffman Estates and Schaumburg have additional stations that have been built in the intervening years but these were all the first for the various villages! 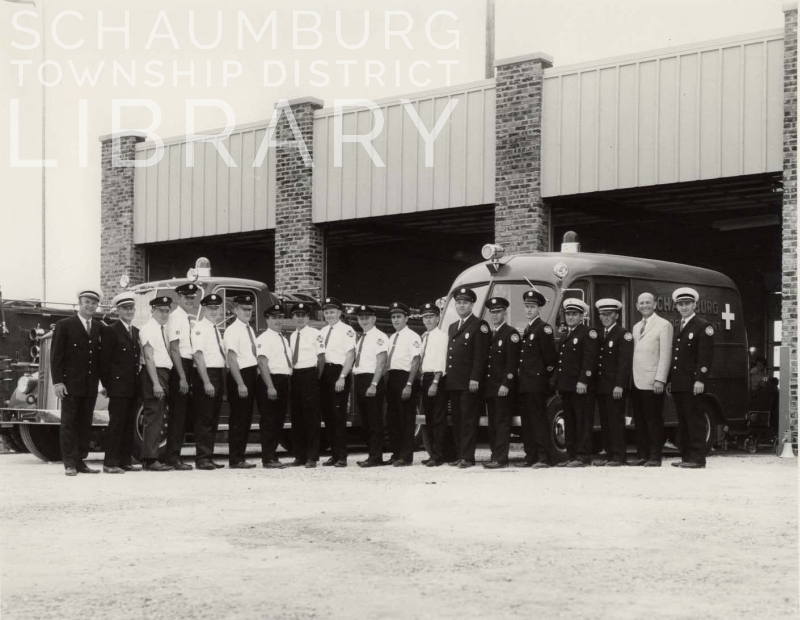 Various articles from the Daily Herald; the Hoffman Estates historical publication, Community From Cornfields; and the Schaumburg publication, Schaumburg Fire Department: A Photographic Tribute were all used to create this blog posting. The photo of the first Schaumburg Volunteer Fire Department was graciously contributed by Rolland Fitch II whose father was on that squad. We thank him for this wonderful addition to the blog posting. The Gieseke hardware store that burned–or partially burned–was the building that is today’s Lou Malnatis. And Mr. Torrence, who first noticed the fire, was staying at Krueger’s, which served as a tavern and hotel that later became known as the Easy Street Pub. But, where was that fire bell located? 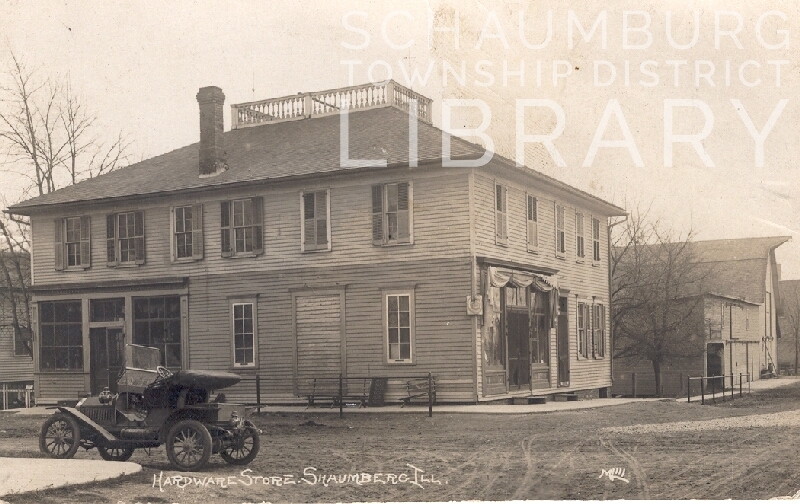 And, was there actually a fire department in rural Schaumburg Township? The answer is “yes” to both questions. The fire bell was in the fire barn that stood between Krueger’s and the Gieseke Hardware store. You can see it in the photo above, hidden behind the tree on the left, with a belfrey on top of the building. The intent was, that if a fire began and you owned shares, your farm would be served by the pumper as soon as it got there. If you did not own shares, the pumper would not be available. 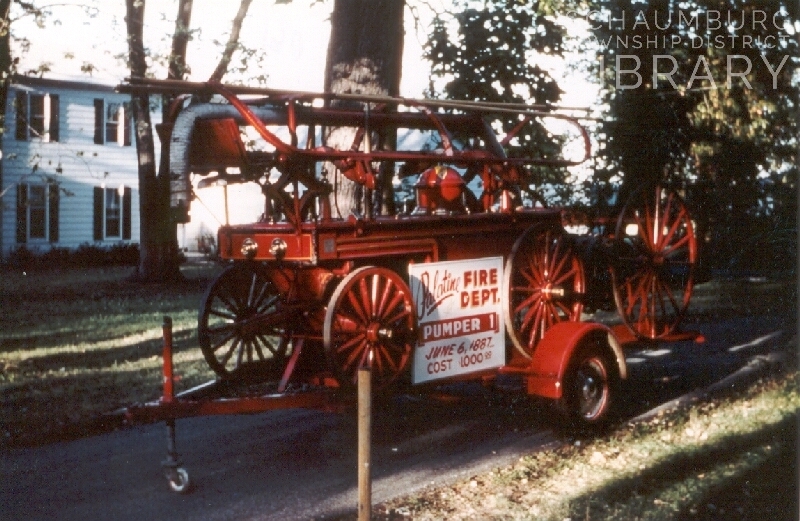 Later, local mutual fire companies operated in the same way. If you didn’t purchase shares in the organization and a fire occurred on your property, the fire department would not respond. It seems a bit cruel but, it was the only way to operate and stay finanically solvent in rural areas where there was not an organized governmental department. This volunteer fire department is mentioned off and on throughout the next few decades. A mention from the November 3, 1905 issue of The Herald states that the department would be holding their annual meeting in Quindel’s Hall to elect officers and enroll new members. (At the time, Quindel’s Hall was the hardware store.) In addition to the meetings, they held picnics to raise funds for the department and as a morale boost for the members. The two gentlemen who seemed to be in charge of the fire department and pushed for new members were H.E. Quindel and John Fenz. 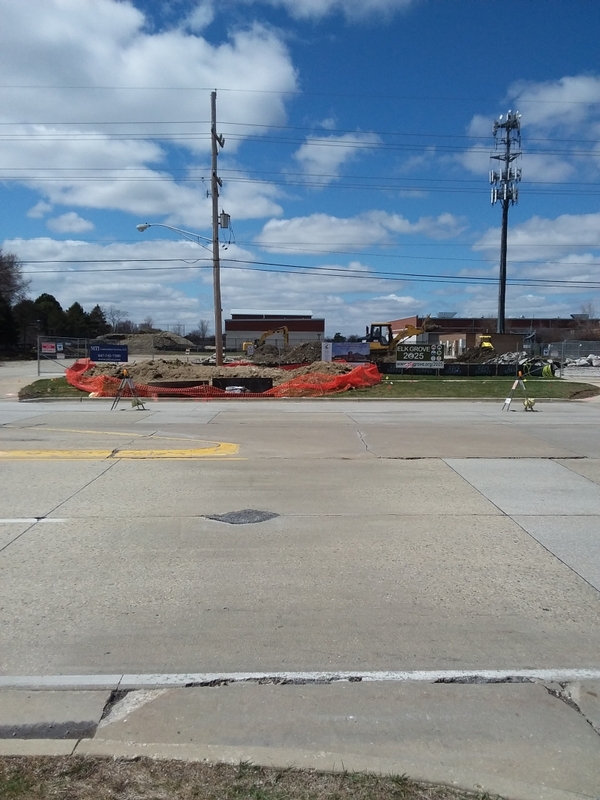 It was definitely in their best interests to have a fire department that could protect their businesses at the intersection of Schaumburg and Roselle Roads. By 1913, this included their homes too which were both at the intersection. This was the Fenz home. This was the Quindel home. By Feburary 20, 1920, the Volunteer Fire Department was “well organized and holding regular meetings the first Tuesday of each month.” The article in The Herald also mentioned that the engine had been overhauled. Another article in the same year mentioned that the Fire Department was selling a truck wagon. However, when two fires happened in 1930 in Schaumburg Center, one was handled with a handheld fire extinguisher and the other, that occurred in the shed behind Lengl’s saloon and restaurant, was handled by the Roselle Fire Department. This gives us a good indication that the Schaumburg Volunteer Fire Department was gone and local residents were relying on the village of Roselle for support. Fire was always a concern in our rural area. Thunderstorms and lightning strikes could ignite houses and barns. Spontaneous combustion in haystacks was always a possibility. Wearing long dresses and cooking with fire was a danger. And, the fact that almost every building was wood accelerated every fire that occurred. Pooling resources–whether it was manpower or equipment or buildings–was a crucial step that the Schaumburg Volunteer Fire Department took to try and fight fires successfully. Next week, look for a blog posting on the first village fire stations in Elk Grove Village, Hoffman Estates, and Schaumburg.